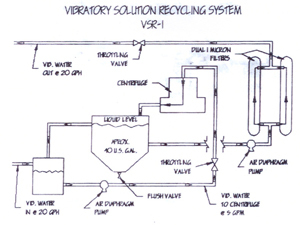 Vibratory solution is gravity fed or pumped to the dirty tank. A 1/2" air diaphragm pump feeds the dirty solution to centrifuge at up to 10 gpm.Centrifuge removes particles down to 3 micron and returns solution to clean tank. 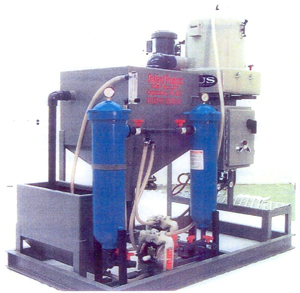 A 1/2" air diaphragm pump, draws from clean tank and pumps solution through two 1 micron parallel cartridge filters, through a flow control (adjustable) meter and back to vibratory system. The clean tank constantly overflows to dirty tank. When solution level drops too low, a float switch tells the make up system to add solution.